Toddler Activities with Paint are a great way for a child to express him or herself and learn about shapes and colors at the same time. This is a great activitity for young toddlers. 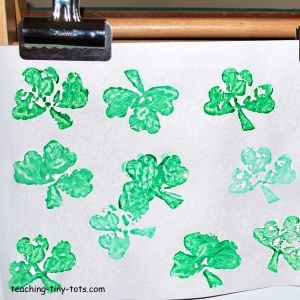 Here's a fun way to make a shamrock...print one with a potato! This sounds trickier than it is...it took about 10 minutes to complete the pattern. Plan your design visually so you have room for all three hearts. If you are using a heart cutter you will be making three hearts and a stem. Press the heart cutter about 1/4th inch into the potato. Press the next two hearts into the potato leaving the cutter in the third heart. With the paring knife, cut into the potato from the side about a 1/4 inch down. Cut until you knife touches the cutter. Using the tip of the paring knife, pop out the pieces around the cutter. Move the cutter back to the middle heart and repeat. After the three hearts are made, cut our a stem...or you can do this before you cut around the three hearts. Mix green with two different amounts of white to get a total of three shades of green. Have child paint directly on the potato with paint. Press onto paper making sure to help put gentle pressure without sliding for best print. Having a brush for each color makes it easier to monitor. Put just enough paint...too much paint can make you lose the shape and the potato may slide a bit. Use a heart shaped cutter and have your child print their own shamrock by printing three hearts and using a brush for the stem. Cut a simple pattern in the potato like stripes and zigzags and watch your child have fun making printed patterns. Toddler Activities involving use of paint are a great way to help develop fine motor skills as well as a great visual way to reinforce color recoginition and even math concepts like counting. Count the number of stamped shapes or the colors used.